Yin 陰 literally means shade, and is associated with quiet, passiveness, femininity. Yang 陽 literally means light, associated with activity, brightness, masculinity. Yin and yang are two opposite but complementary principles that regulate the functioning of the cosmos. Each contains the seed of the other, which is expressed as a black spot of Yin in the white Yang and vice versa. Their repeated alternation provides the energy necessary for the cosmos to sustain itself. 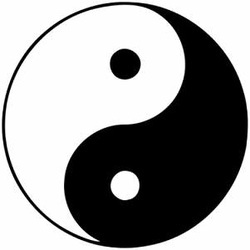 The concept of yin and yang is often expressed by the Taiji symbol. Taiji is translated as Supreme polarity.